Gingival recession is defined as exposure of the root surface due to a displacement of the gingival margin apical to the cemento-enamel junction. Gingival recession in multiple anterior teeth is a common concern due to esthetic reasons or root sensitivity. There are various mucogingival surgeries for root coverage procedures. Coronally advanced flap is one of the common procedures for root coverage in multiple teeth. But all these procedures have a common requirement of adequate width of attached gingiva. In many cases where inadequate width of attached gingiva is present, a variety of techniques to increase the width of attached gingiva are performed prior to root coverage procedures. In this way, two separate surgical procedures may be required for adequate root coverage, which is very tedious for the patient and the dentist. In this case report, these two surgical procedures are combined in a single technique to cover multiple recessions in anterior region and simultaneously to increase the width of attached gingiva. Here, coronally repositioned flap technique for root coverage, along with vestibular deepening technique to increase the width of attached gingiva was performed for treatment of multiple recessions. 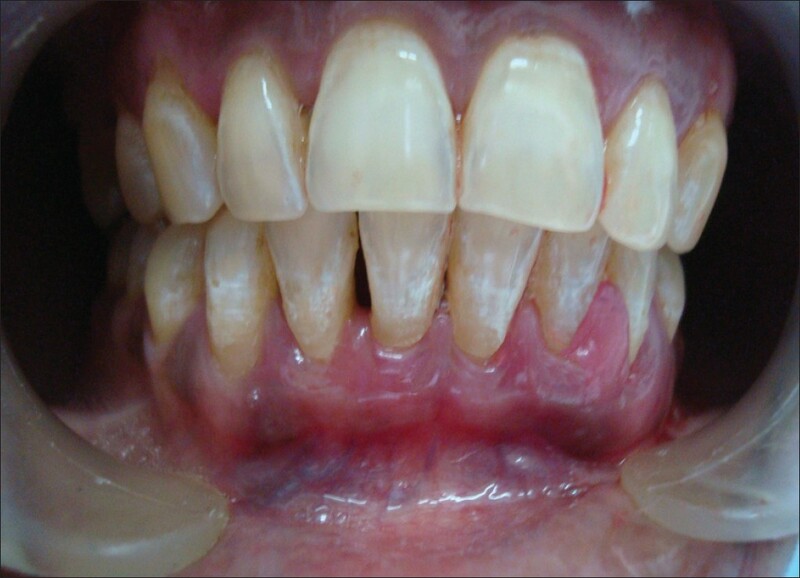 A female patient aged 42 years reported in the Faculty of Dental Sciences, Banaras Hindu University, Varanasi, Uttar Pradesh, India, with a chief complaint of receding gums in multiple lower anterior teeth. Clinical examination revealed an inadequate zone of attached gingiva (tension test-positive) with shallow vestibule appearing. The recession was Grade II, according to Miller's classification, in 32, 31, 41 teeth  [Figure 1]. The recession was uniform of about 4 mm in all the lower anteriors and the width of attached gingiva was 2 mm. Intraoral periapical radiograph in relation to 32, 31, 41 revealed adequate bone support in interdental areas. Clinical parameters were recorded using UNC-15 periodontal probe. Clinical parameters included Probing Pocket Depth (distance from gingival margin to base of pocket), Gingival Recession (distance from cemento-enamel junction to gingival margin), width of attached gingiva (distance from base of pocket to mucogingival junction), and Clinical Attachment Level (distance from cemento-enamel junction to base of pocket). The procedure was well explained to the patient and informed consent was obtained for surgery. The patient was medically sound and fit, so a surgical procedure was planned. Scaling and root planing was done prior to surgery. After administering local anesthesia (2% lignocaine hydrochloride with 1:80,000 epinephrine), an incision was made in the vestibule from 33 to 43 [Figure 2] into the periosteum at its base and the bone was exposed so that scar formation could occur. 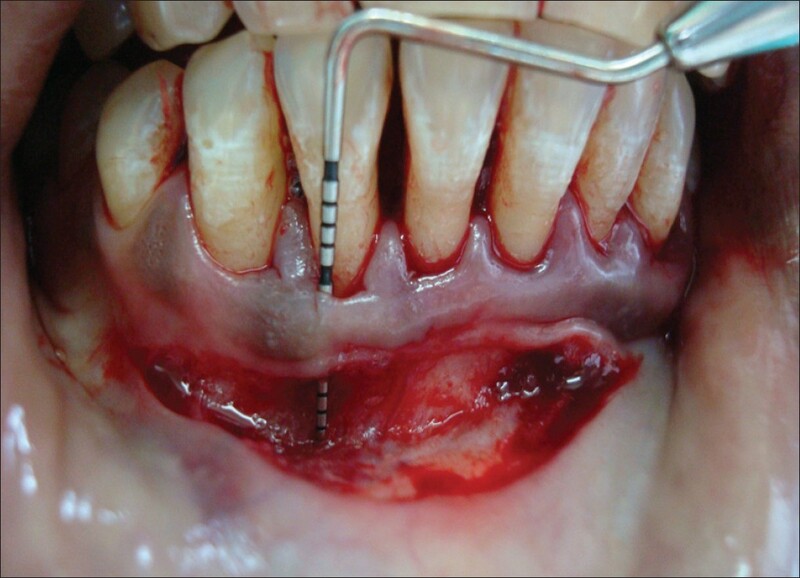 This procedure deepens the vestibule with fenestration technique to increase the width of attached gingiva. The surgical procedure included the bridge flap technique as introduced by Marggraf  and later on modified by Romanos. A spilt-thickness flap was elevated in the apicocoronal direction by making a sulcular incision, connecting it with the first incision so that the whole bridge flap could be elevated and repositioned coronally to cover the denuded root surfaces from 33 to 43 [Figure 2]. No vertical incisions were given. This forms a bridge from coronal aspect to the vestibule as shown in [Figure 2]. Thereafter, root conditioning was done with tetracycline HCl. Then, the flap was repositioned coronally with interrupted stabilization sutures [Figure 3] and, in the vestibule, the epithelium was sutured with the periosteum [Figure 3]. Sutures were resorbable in nature. 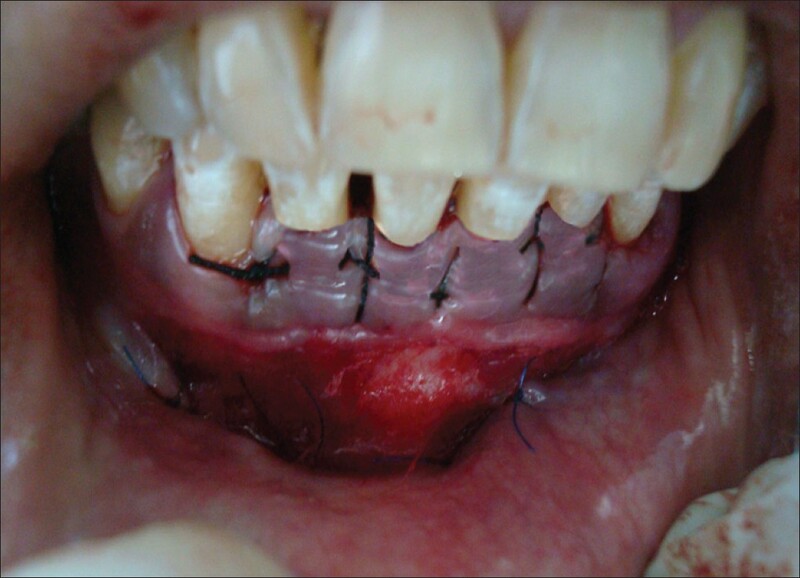 After suturing, periodontal dressing was given [Figure 4]. Patient was discharged with all post-surgical instructions and medications for 5 days to avoid postoperative pain and swelling. Patient was recalled after 7 days for suture removal. The surgical site was examined for uneventful healing. 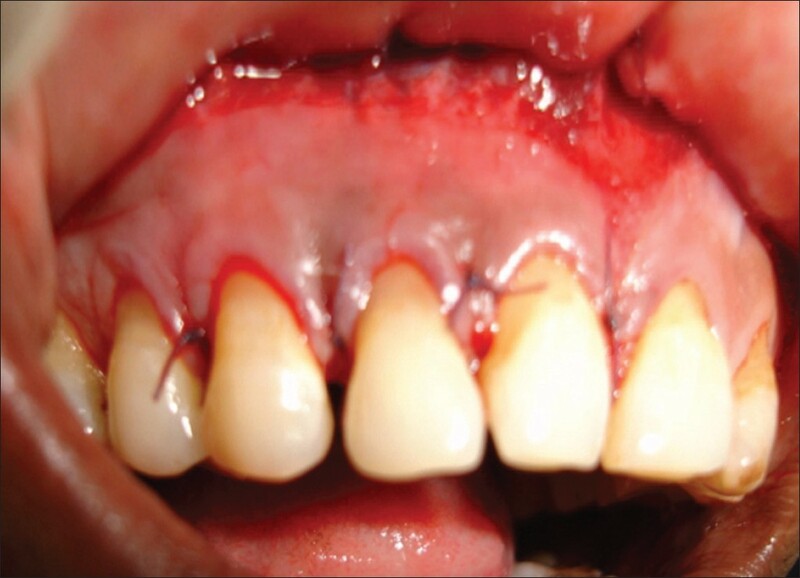 There were no postoperative complications and healing was satisfactory with significant root coverage and significant gain in attached gingiva and clinical attachment was 5 mm [Figure 5]. Postoperative recession at 1 month follow-up was about 1 mm. Patient was instructed to use soft toothbrush for mechanical plaque control in surgical area. Patient was monitored on weekly schedule postoperatively, to ensure good oral hygiene in the surgerized area. Supportive periodontal maintenance at 3 months was prescribed to maintain periodontal health and to re-evaluate this area; 9 months follow-up showed no recurrence. A 34-year-old male patient reported in the Faculty of Dental Sciences with a chief complaint of unesthetic gums in upper right anterior teeth. The recession was Grade II, according to Miller's classification, in teeth 13, 12, 11 [Figure 6]. 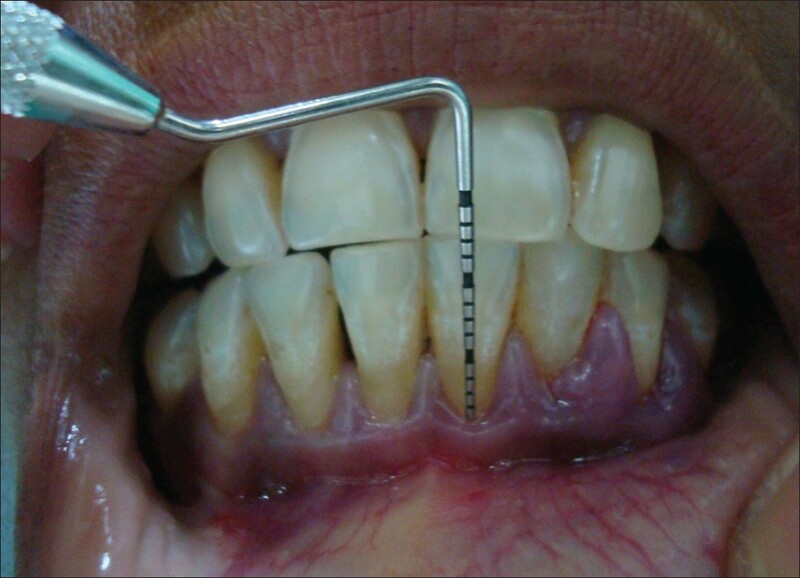 The recession was about 4 mm, 3 mm, and 2 mm, respectively, in 13, 12, and 11, and the width of attached gingiva was 2 mm. IOPA radiograph revealed adequate bone support. Patient had no contributory medical history, so a surgical procedure was planned after complete scaling and root planing. After local anesthesia was administered, an incision was made in the vestibule from 14 to 11 [Figure 7], beyond the mucogingival junction, for vestibular deepening with fenestration technique to increase the width of attached gingiva. Then, with sulcular incisions, a coronally advanced flap was raised with split-thickness flap from 13 to 11 [Figure 7]. No vertical incisions were made. Thereafter, root conditioning was done with tetracycline HCl. Then, the flap was repositioned coronally with interrupted stabilization sutures [Figure 8], and in the vestibule, epithelium was sutured with the periosteum [Figure 8]. Sutures were resorbable in nature. Patient was discharged with post-surgical instructions and medications. Patient was recalled after 7 days for suture removal. Healing was satisfactory with no postoperative complications [Figure 9]. Postoperative recession was now 2 mm, 1 mm, and 1 mm, respectively. Patient was instructed to use soft toothbrush and was monitored weekly; 11 months follow-up showed no recurrence. 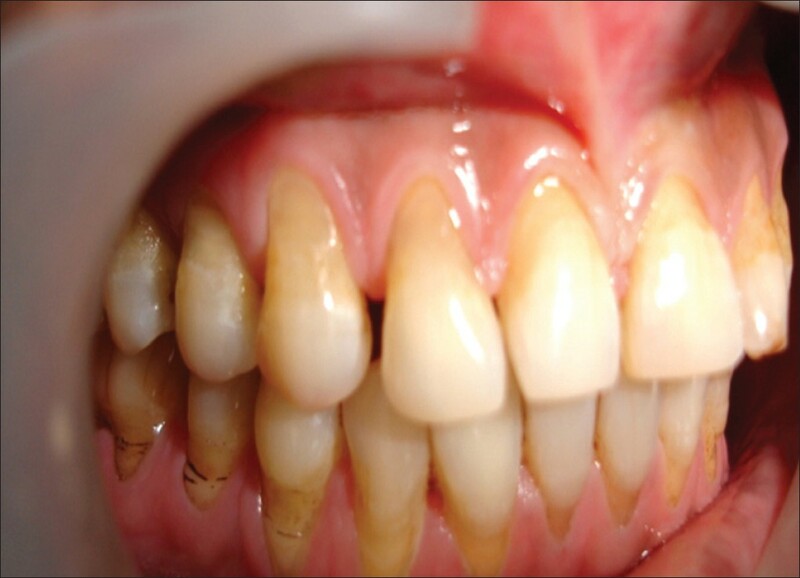 Gingival recessions are regularly linked to the deterioration of dental esthetics. The bridge flap technique includes two surgical techniques simultaneously. In this technique, the flap which covers a denuded root surface is supplied by plasmatic circulation from capillaries in the adjacent portion of the gingiva, allowing it to survive. The flap creates a healthy, functional, and esthetic result that appears to be resistant to further recurrence. The bridge flap technique is indicated when a single surgical procedure is desired to predictably cover the denuded root surfaces, in cases where inadequate keratinized gingiva is available, and also to increase the width of attached gingiva with vestibular deepening at one step. 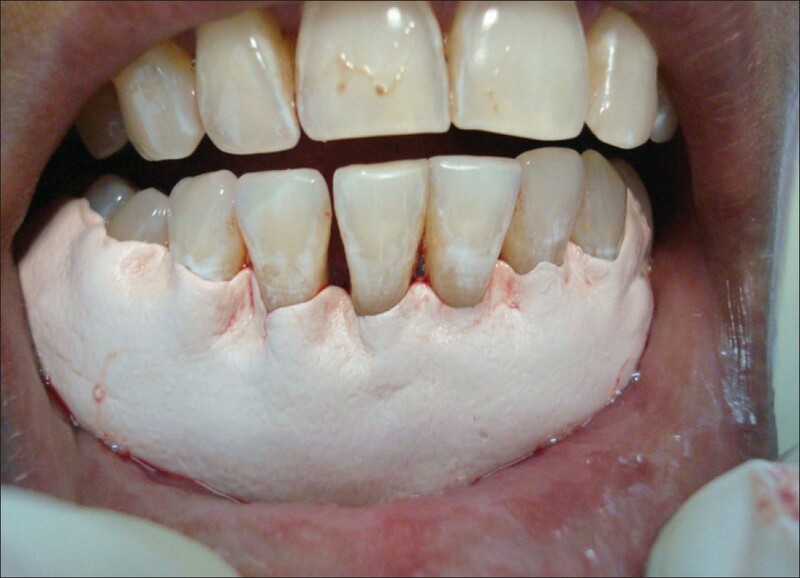 An evaluation of adequate width of attached gingiva in patients with multiple recessions is an important factor before deciding on any procedure for root coverage. To obtain optimum esthetic result, the gingival form, tooth anatomy, and the relationship of the underlying bone to the cemento-enamel junction must be completely understood. Precise determination of the location of the CEJ and mucogingival junction prior to surgery and precise placement of incisions are necessary in order to achieve this goal. The amount of attached gingiva needs to be measured as a part of the assessment. It has been shown that to maintain periodontal health, there should be 2-3 mm of attached gingiva. In this case, vestibular deepening was included as treatment of choice in order to maintain the periodontal health and root coverage with coronally advanced flap was done to improve postoperative esthetics of the patient. Patient was monitored on weekly schedule to ensure good oral hygiene in the surgerized area and supportive periodontal maintenance at 3 months was prescribed to re-evaluate this area. The postoperative esthetic result was satisfactory for the patient. The secondary outcome variables were recession reduction (85%), clinical attachment gain, keratinized tissue gain, esthetic satisfaction, reduced root sensitivity, and postoperative patient pain. Clinical results 3-11 months postoperatively were favorable with no recurrence. However, when a significant loss of the periodontal attachment apparatus and osseous structure occurs, the long-term prognosis becomes poor. Treatment strategies used in this case suggests that combination of two surgical modalities can be successful for the management of multiple teeth recessions. Successful treatment of multiple recessions is based on the use of predictable periodontal plastic surgery (PPS) procedures. Careful preoperative diagnosis and appropriate case selection are the prerequisites for improving surgical success. Multiple teeth recessions is associated with different etiologies, which should be carefully identified before treatment. Coronally advanced flap along with vestibular deepening, and bridge flap technique may be used for successful management of multiple teeth recessions. 1. Kassab MM, Cohen RE. 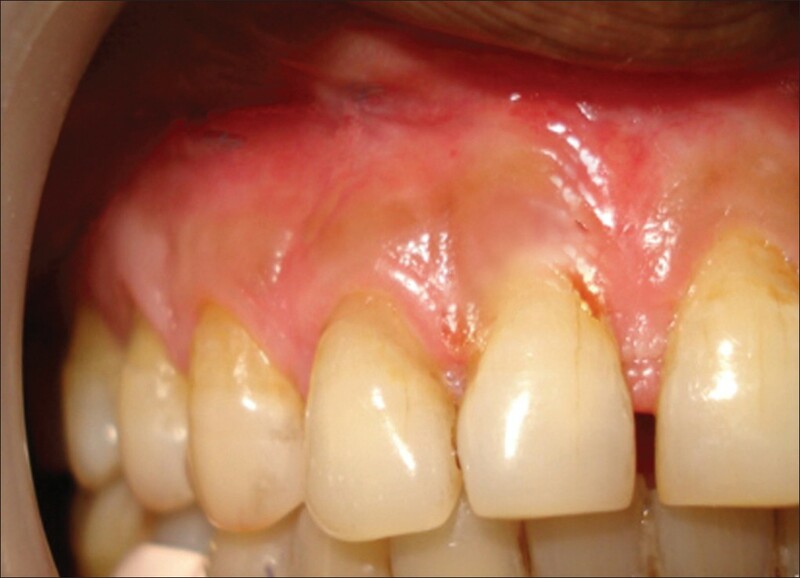 The etiology and prevalence of gingival recession. J Am Dent Assoc 2003;134:220-5. 2. Roccuzzo M, Bunino M, Needleman I, Sanz M. Periodontal plastic surgery for treatment of localized gingival recessions: A systematic review. J Clin Periodontol 2002;29:178-94. 3. Cheng YF, Chen JW, Lin SJ, Lu HK. Is coronally positioned flap procedure adjunct with enamel matrix derivative or root conditioning a relevant predictor for achieving root coverage? A systemic review. J Periodontal Res 2007;42:474-85. 4. Wade AB. Vestibular deepening by the technique of Edlan and Mejchar. J Periodontal Res 1969;4:300-13. 5. Miller Jr PD. A classification of marginal tissue recession. Int J Periodontics Restorative Dent 1985;18:444-53. 6. 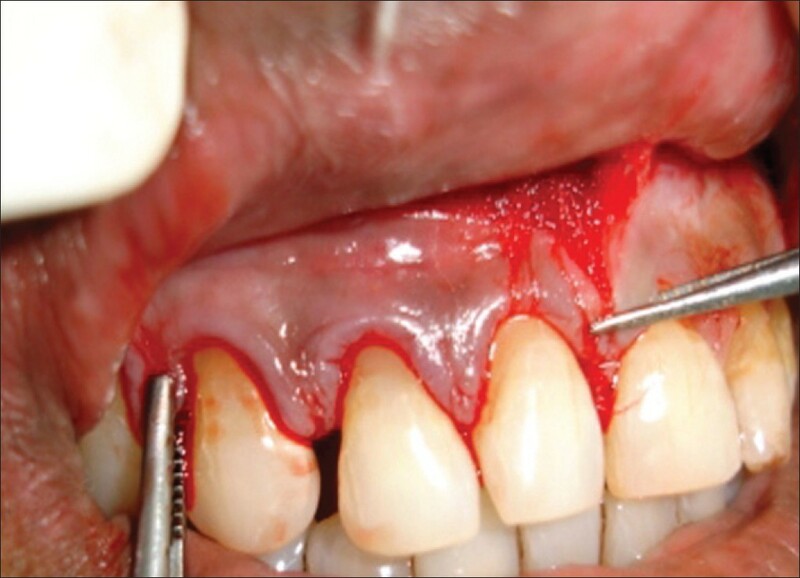 Gupta V, Bains VK, Mohan R, Bains R. Bridge flap technique as a single-step solution to mucogingival problems: A case series. Contemp Clin Dent 2011;2:110-4. 7. Marggraf E. A direct technique with a double lateral bridging flap for coverage of denuded root surface and gingival extension. Clinical evaluation after 2 years. J Clin Periodontol 1985;12:69-76. 8. Romanos GE, Bernumoulin JP, Marggraf E. The double lateral bridging flap for coverage of denuded root surface: Longitudinal study and clinical evaluation after 5 to 8 years. J Periodontol 1993;64:683-8. 9. Jagannathachary S, Prakash S. Coronally positioned flap with or without acellular dermal matrix graft in the treatment of class II gingival recession defects: A randomized controlled clinical study. Contemp Clin Dent 2010;1:73-8. 10. Chambrone L, Sukekava F, Araújo MG, Pustiglioni FE, Chambrone LA, Lima LA. Root-coverage procedures for the treatment of localized recession-type defects: A Cochrane systematic review. J Periodontol 2010;81:452-78. 11. Davis LG, Ashworth PD, Spriggs LS. Psychological effects of esthetics dental treatment. J Dent 1998;26:547-54. 12. Maynard JG Jr, Wilson RD. Physiological dimensions of the periodontium significant to the restorative dentist. J Periodontol 1979;50;170-4. 13. Nevis M, Skurow HM. The intracrevicular restorative margin, the biological width and maintenance of the gingival margin. Int J Periodontics Restorative Dent 1984;4:30-49.